Ahh, the Maine woods! Whether that brings to mind fresh air and wildlife or bug spray and big boots, you can certainly count on some great hiking in Ogunquit. Highlights will include actual time spent in the Maine woods and adventures worth sharing on Instagram, Facebook or Pinterest. Ogunquit is the spot for a hiking adventure no matter what level. Much like Robert Frost, you can choose your path. Often noted as one of the most painted landscapes in Maine, the Marginal Way is really more of a ocean cliff walk than a hike. But it is so beautiful and peaceful that it has to be on your list. Covering a mile and a half in length, the path showcase the rocky coastline Maine is famous for. Additionally, since the path ends in the village center on one end and in Perkins Cove on the other, you can easy explore Ogunquit and hike all in the same afternoon. With the stunning views, you probably won’t work up a sweat but you will most definitely be inspired. Sure a day at the ocean is nice, but from this mountain the view is absolutely charming. Be sure to bring your camera for a panoramic of Southern Maine. Yes, you can drive to the top to see this view too. However, we encourage you to pack some snacks and enjoy the extensive trails. With the chance to see habitats and Mt. Washington in the distance, you can hike for a little or hike for a lot. Trails here take hikers on a tour around the protected salt marsh, an uncommon sight in Maine. The grasses are an important environmental product and the views are unmatched. Bring your binoculars for birding – there’s always some spectacular wildlife to enjoy. And with wheelchair access, this trail is all ages and ability friendly. A cliff walk around the bold shorefront of Cape Arundel in Kennebunkport to Spouting Rock and Blowing Cave. This path is more of a strolling walk to take in the dramatic views of the ocean. Parsons Way is named after Henry Parsons, who gave the land to Kennebunkport “so that everyone may enjoy its natural beauty.” Check out the sprouting sea clefts, and the ever-changing views as you round Cape Arundel – then head into the ‘port to enjoy some fried clams. 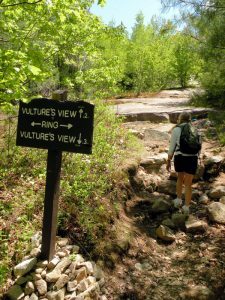 Still not sure about hiking in Ogunquit? Add a little outdoor fun with a paddle board up the Ogunquit River or take a Nubble cruise to see the sights. Ogunquit from this view is absolutely charming. Be sure to bring your camera. There really is nothing as refreshing as the crisp Maine air to super charge you for a great outdoor ocean adventure.